Having photographed many weddings at Trillium over the years, I believe I’m qualified to offer up this guide as well as my own tips for planning your wedding here. 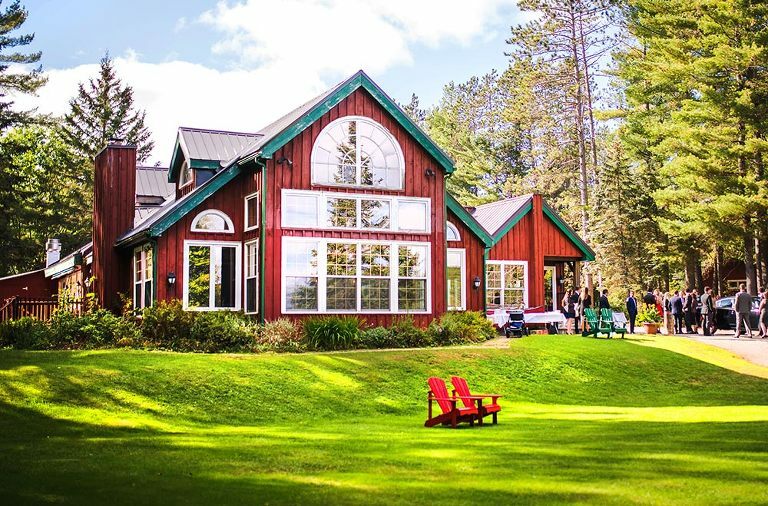 When you book your wedding at Trillium, you have the entire resort for the weekend. So picture this… you and your bridal party arrive Thursday afternoon to get settled and begin getting things organized on Friday before your guests arrive. As guests begin to filter in Friday evening you’re now free to join in all the fun during your welcome festivities and bonfire. On Saturday morning, a tasty buffet breakfast waits in the main lodge where everyone can mix and mingle some more. After breakfast, your guests can go enjoy some relaxing Trillium activities while you and your bridal party begin to get ready. After the wedding, your guests can easily make their way back to their cottages without having to worry about cabs, ubers and such. For guests who do not have a cottage, most couples rent a local bus that brings them back to their hotel which isn’t too far away. 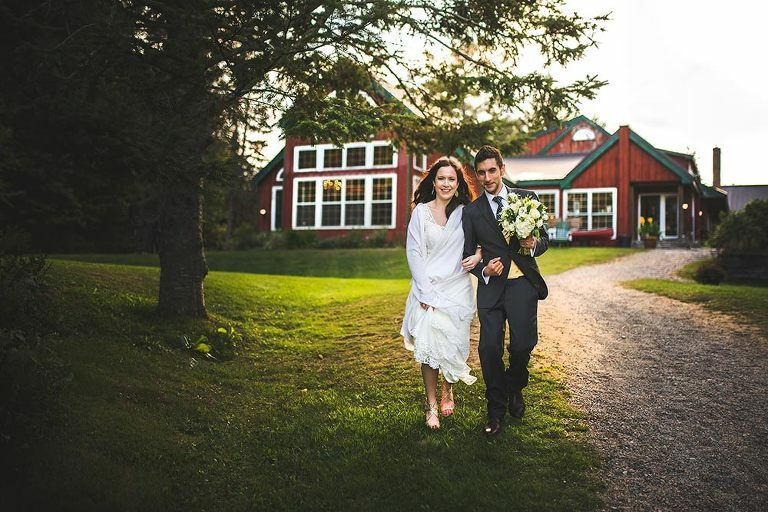 Trillium Resort: It’s like a mini-destination wedding at a big ole Muskoka cottage for the weekend. 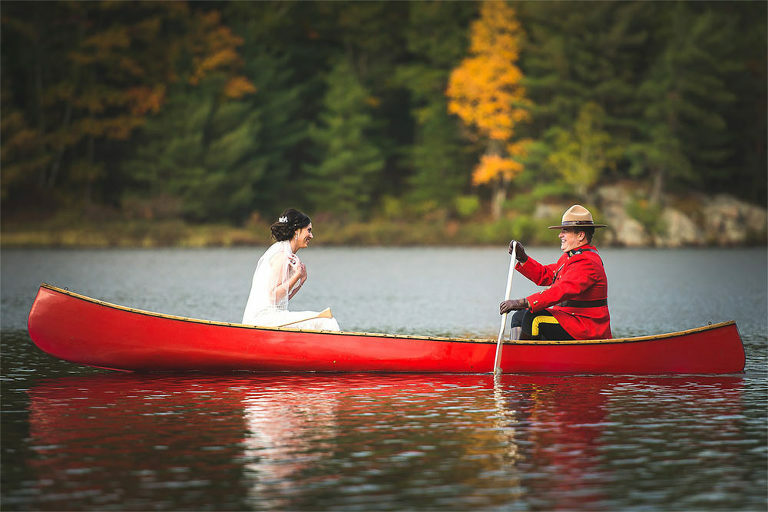 RCMP Mountie with his bride in a canoe on Devine Lake, Trillium Resort. The resort boasts 86 acres of beautiful Muskoka forest right on Devine Lake. Regardless of season, Trillium has all kinds of activities for relaxing as well as getting your heart rate up. Accommodations: 60 guests across 17 cottages and chalets with a total of 23 bedrooms. Additional guests are typically brought in by bus from nearby hotel. 6 kms of hiking trails, canoes, kayaks, pedals boats, row boats, paddle boards, bike rides etc. The quick answer is, anytime. 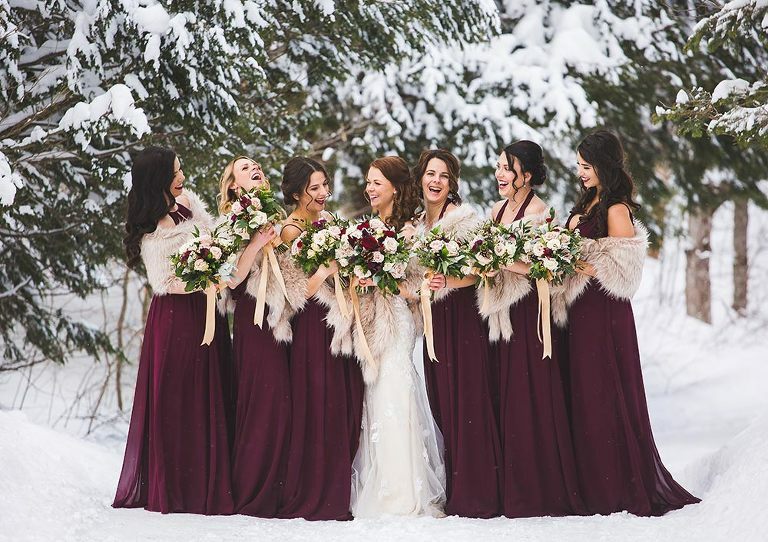 Unlike many wedding venues, Trillium Resort is a year-round destination that offers plenty of activities and loads of photo opportunities regardless if you’re there in Spring, Summer, Fall or Winter. Designed with the classic styling of Rocky Mountain lodges, Trillium looks every bit as amazing – minus the mountains of course. There are several options when it comes to selecting where you would like to get ready the morning of your wedding. The popular choices are the Falling Water cabin, the upstairs room over the main lodge reception area and the Trillium Spa. I’ve shot in each of these locations at Trillium and each have their own benefits however my recommendation – book the Trillium Spa lodge for you and your girls! I also recommend having the fellas get ready in the main lodge meeting room above the reception area. The Spa has two floors, the bottom floor is super-spacious with a large stone fireplace, large comfy couches and huge windows. From a wedding photographer’s point of view, this is gold Jerry! The upstairs has another large room with some fancy furniture and another larger set of windows. You and your bridesmaids will love all the room you’ll have to roam while they get ready. Plus it’s away from all the other cabins providing plenty of privacy. The best option for the guys is the meeting room above reception in the main lodge. It’s a large open room with it’s own bathroom. It has great light and easy access to some nice spots to shoot outside. It’s also easy to find so groomsmen don’t get lost! Here’s a quick snapshot of my “getting ready” location options at Trillium for both winter and summer weddings. They’re ranked in order based on two main criteria: how well they accommodate groups of people as well as the best photography options. The main reason I do not recommend the standard and lake view cabins is simply due to size. While they’re certainly spacious as guest cabins, they’re not ideal when you bring bridesmaids, groomsmen, parents and wedding vendors all in the same space together. It can get a little cramped. You have two primary locations for your ceremony – the front lawn as well as inside the main lodge. Regardless of the season, either option is available. There is also a less common location down on the beach. Which one should you choose? This is by far the most popular choice as it’s elevated and overlooks beautiful Devine Lake. The towering trees surrounding this location add to the authentic Muskoka wedding vibe. Even in winter, staff clear the snow from the lawn and set everything up just the same as they do in the summer. Add in some lightly falling snow flakes… winter wonderland wedding anyone? Outdoor ceremony location on the lawn at Trillium Resort and Spa. Outdoor lawn ceremony in winter. Chilly but beautiful. In the event of rain, or if you’re having a winter wedding – the dining room in the main lodge can serve as your ceremony location. The large windows, rustic chandeliers and cozy fireplace provide a beautiful backdrop for you and your guests. While the outdoor lighting of the front lawn provides the most flattering lighting scenario, the dining room is a solid backup plan with those massive windows. Ceremony inside Trillium Resort main lodge in winter. Milli and her team are fantastic. Wedding reception setups always look incredible and there are so many table configurations to meet any size of group. One of my favourite things about weddings at Trillium is the food. The chef and entire team are amazing – your guests will thank you after every bite. Once dinner and speeches are finished, you and your guests move into the lounge area outside of the dining room while Trillium staff clear tables and set up your dance floor. Typical turnaround time is 20-30 minutes, plenty of time for everyone to mingle, indulge in some treats before filing back in to get the party started. Reception dinner set up in the main lodge. Quick Tip: That 20-30 minute break while staff are turning around the dining room is the perfect time for a cake cut and/or sneaking outside to grab some fun night photos (sparklers perhaps?). Trillium has a warm glow against the blue night sky with the towering silhouetted trees on either side. Many of my couples request that exact photo. There’s a very good reason Trillium Resort is on my Best Muskoka Wedding Venue list… it’s beauty, food, staff and on-site accommodations. It’s a mini-destination wedding getaway just a couple hours north of the city! Contact them here.